London Guide: Ten Things To Do In Bermondsey. Homeboy and I moved just around the corner from Bermondsey Street six months ago. Now that we’ve finished renovating our apartment, we are very happy to be out exploring this amazing area. If you’re looking for things to do in London or places to visit in South East London read on to discover Ten Things To Do In Bermondsey, Southwark. Bermondsey Beer Mile, Druid Street and Enid Street: Very near Maltby Street Market you’ll find many microbreweries situated in the railway arches. Many are open at the weekend, so you can pop in and sample the craft beer or cider. Pocket Parks: You can sit down and relax in a cute little pocket park. Bermondsey Spa Gardens is opposite the Buddhist Centre. 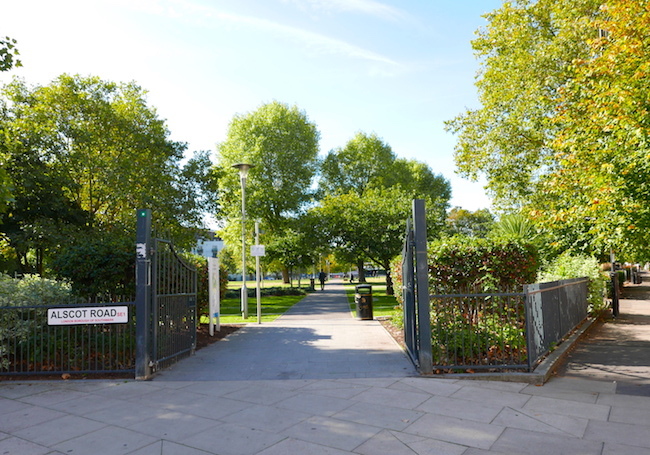 Tanner Street Park is located on Bermondsey Street where you can watch people playing tennis. There’s a little park behind St Mary Magdalen Churchyard on Bermondsey Street / Tower Bridge Road. Leathermarket Gardens has splendid flower beds with roses. Before we moved to the area, I wrote an article about Bermondsey Street. I think this is the best street in London which is why we moved as close to it as possible. There are so many interesting places to visit along the road. You’ll also find plenty of restaurants, bars and cafes here. For historical information about the area read the Bermondsey Wikipedia page. Check out my Love Bermondsey London Pinterest Board for pictures of the area. Author: Homegirl London. Photographs: Homegirl London. The featured image for this article is the Mandela Way T-34 Tank which has been nicknamed Stompie. Apparently, it was placed on a plot of land when the council turned down a building application!